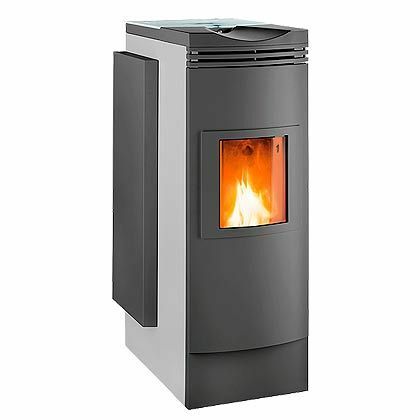 FireWIN is a state of the art wood pellet boiler combined with the features of a room heating stove. This makes the FireWIN the ideal feature appliance for any low carbon building. Its stylish finish along with a host of innovative Windhager features ensures that the FireWIN doesn’t look out of place in any property whilst providing high efficiency heat. FireWIN is available as a hand fed unit with its integrated 37kg hopper or as an automatically fed appliance. The unique Windhager pellet feed suction system can replenish the FireWIN hopper for a remote bulk pellet hopper in seconds. The remote pellet hopper can even be situated up to 25 metres from the appliance. Two options are available for cleaning, the Klassik version has a cleaning lever to clean the heat exchanger with the ash easily removed from the ash bin below the burner bowl, the Exklusiv version incorporate an automated cleaning mechanism and ash compression of the integral ash bin for prolonged cleaning and maintenance periods. FireWIN is supplied with a range of control and distribution options. It can be supplied as a system boiler with all of the heating components neatly installed within the boiler casing (expansion vessel, safety set, pumps and blending valve).